Welcome to Trustly Casino MobileWins. If you make your first deposit using Trustly, you will receive Welcome Bonus 200% up to $/£/€100! Here at MobileWins Trustly Casino, we offer over 800 games playable on any device. Continue reading and find out how! 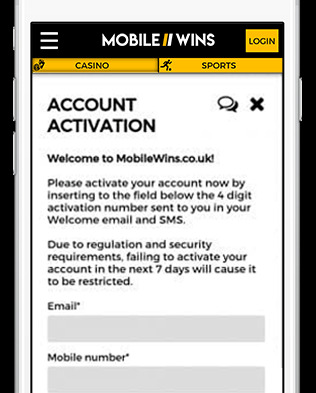 At MobileWins, you receive a Welcome Bonus 200% up to $/£/€100 on your first deposit when using Trustly. The first deposit bonus is up to a maximum of 200 EUR/GBP/USD. You simply have to make your first deposit and start playing to receive your bonus. We couldn’t have made it any easier, but there is always a support standing by if you have any questions! Play any of our games right now. Each game is optimised for both mobile and desktop and can be played using Trustly deposits. We offer other payment methods as well which you can find right here. We also offer a staggering wide range of slots. Ente your details into the registration form. Do make sure to enter your correct mobile phone number as we will be sending you a confirmation message with a code for verification. You will now see a pop-up message. Click OK to activate your account. A confirmation email is being sent to your inbox. Keep it safe as it has your username on it! You are nearly there, just some quick things left! 2) Pick any addition deposit codes you may have. That’s that. You can now play any of our games in real money mode and you will receive the bonus! Choose your games now and best of luck to you!